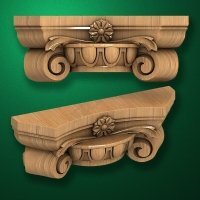 Carved capitals made of wood and MDF for decorating furniture elements and use as architectural elements. Capitals for the top of columns and pilasters. Price from the manufacturer. Produced in Russia with delivery anywhere in Russia and worldwide.